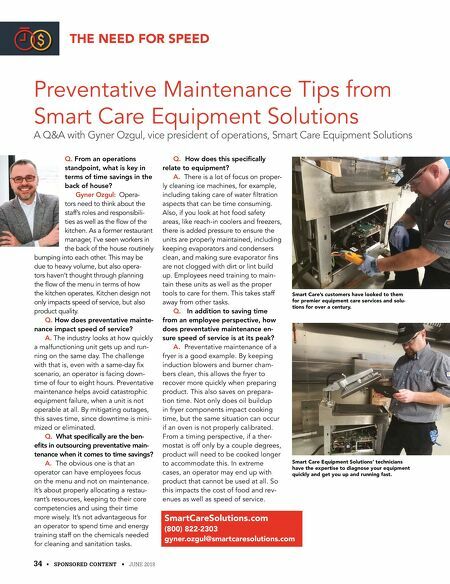 34 • SPONSORED CONTENT • JUNE 2018 Preventative Maintenance Tips from Smart Care Equipment Solutions A Q&A with Gyner Ozgul, vice president of operations, Smart Care Equipment Solutions THE NEED FOR SPEED Q. From an operations standpoint, what is key in terms of time savings in the back of house? Gyner Ozgul: Opera- tors need to think about the staff's roles and responsibili- ties as well as the flow of the kitchen. As a former restaurant manager, I've seen workers in the back of the house routinely bumping into each other. This may be due to heavy volume, but also opera- tors haven't thought through planning the flow of the menu in terms of how the kitchen operates. Kitchen design not only impacts speed of service, but also product quality. Q. How does preventative mainte- nance impact speed of service? A. The industry looks at how quickly a malfunctioning unit gets up and run- ning on the same day. The challenge with that is, even with a same-day fix scenario, an operator is facing down- time of four to eight hours. Preventative maintenance helps avoid catastrophic equipment failure, when a unit is not operable at all. By mitigating outages, this saves time, since downtime is mini- mized or eliminated. Q. What specifically are the ben- efits in outsourcing preventative main- tenance when it comes to time savings? A. The obvious one is that an operator can have employees focus on the menu and not on maintenance. It's about properly allocating a restau- rant's resources, keeping to their core competencies and using their time more wisely. It's not advantageous for an operator to spend time and energy training staff on the chemicals needed for cleaning and sanitation tasks. Q. How does this specifically relate to equipment? A. There is a lot of focus on proper- ly cleaning ice machines, for example, including taking care of water filtration aspects that can be time consuming. Also, if you look at hot food safety areas, like reach-in coolers and freezers, there is added pressure to ensure the units are properly maintained, including keeping evaporators and condensers clean, and making sure evaporator fins are not clogged with dirt or lint build up. Employees need training to main- tain these units as well as the proper tools to care for them. This takes staff away from other tasks. Q. In addition to saving time from an employee perspective, how does preventative maintenance en- sure speed of service is at its peak? A. Preventative maintenance of a fryer is a good example. By keeping induction blowers and burner cham- bers clean, this allows the fryer to recover more quickly when preparing product. This also saves on prepara- tion time. Not only does oil buildup in fryer components impact cooking time, but the same situation can occur if an oven is not properly calibrated. From a timing perspective, if a ther- mostat is off only by a couple degrees, product will need to be cooked longer to accommodate this. In extreme cases, an operator may end up with product that cannot be used at all. So this impacts the cost of food and rev- enues as well as speed of service. SmartCareSolutions.com (800) 822-2303 gyner.ozgul@smartcaresolutions.com Smart Care's customers have looked to them for premier equipment care services and solu- tions for over a century. 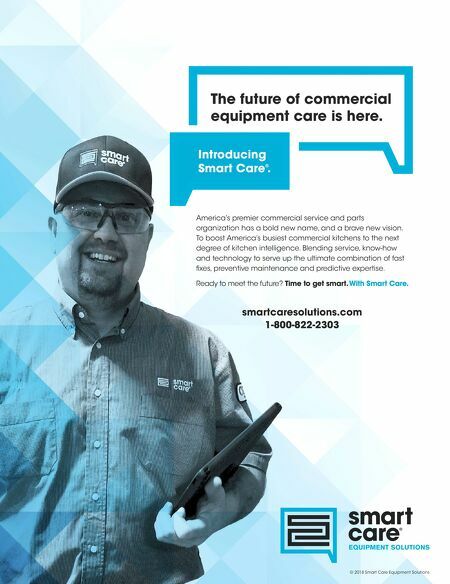 Smart Care Equipment Solutions' technicians have the expertise to diagnose your equipment quickly and get you up and running fast.